What did you think of Solve for the Variable Involving Addition and Subtraction ? Use inverse operations to solve the equation for a variable. 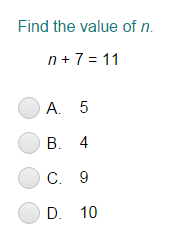 For example, consider the equation a – 4 = 2. Here, 4 is subtracted from a on the left side. So, to find the value of a, we use inverse operation of subtraction, that is, addition.